For professional lawn aeration services in Apex, Cary, Carrboro, Chapel Hill, Durham, Hillsborough, Morrisville and the West Raleigh area you can count on the team at Pleasant Green Grass. Aeration is one of the most important procedures for maintaining a beautiful and healthy lawn. Typical North Carolina soil (Durham, Chapel Hill, Cary, Apex, Raleigh, Hillsborough, and Morrisville) is made up primarily of hard compacted clay. Compacted soils reduce drainage, increase runoff, and inhibit root growth. Soil compaction promotes weed growth as well. Aeration prevents soil from becoming overly compacted. Loose soil allows organic lawn treatments, nutrients, water, and air to penetrate the soil and access the root zone helping the roots to dig deeper into the soil. Deep digging roots tolerate stress and drought better than shallow roots. Aeration also helps to prepare the soil for over seeding. Due to the high clay content in Piedmont soils aeration should be performed at least once per year. Warm season grasses should be aerated in late spring/early summer and cool season grasses in the fall or spring. Contact us to schedule an aeration service. Compacted soil prevents turf from establishing a healthy root system. Adequate amounts of vital turf nutrients are unable to reach the roots. Aeration relieves soil compaction by removing cores of turf up to 3 inches in depth. Once the soil is aerated air exchange improves and the soil so that it can easily absorb water, fertilizer, and other nutrients. Aeration promotes deeper root growth for a lush, healthy and drought-resistant lawn. Double aeration is the same as aeration except our technician will make two passes over the lawn. This is recommended for people with severely compacted lawns or those that are attempting to over seed a lawn. The best time for aeration is during the growing season, when the grass can heal and fill in any open areas after soil plugs are removed. Ideally, aerate the lawn with cool season grass in the fall and early spring and those with warm season grass in the late spring and summer. Follow this up with organic fertilization & weed control, for a healthy thriving lawn. 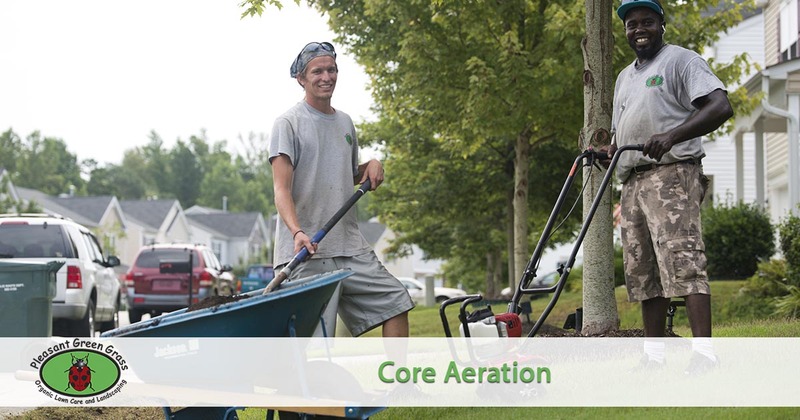 Ready to schedule your core aeration service? Give us a call at 919-357-8245. We will provide you with a free quote and make scheduling your service convenient.